Growing tropical orchids as I do indoors, it’s easy to forget that orchids grow all over the world, and Ontario, Canada is no exception. 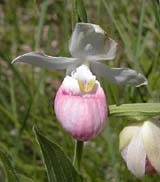 In one special place, the Bruce Peninsula on Georgian Bay, 44 of 60 of Ontario’s native species can be found growing, more varieties of orchid than any other area its size in Ontario, and possibly all of North America. The latitude, the moderating effect of the Great Lakes (which surround the Bruce on three sides), the calcium-rich soil of the Niagara Escarpment, and the wide variety of habitats found there seem to contribute to the large variety of native orchid species.